Radja Nainggolan – will he stay or will he go? Half of the Belgian squad play in the Premier League. Eden Hazard and Vincent Kompany are arguably more famous than their counterparts in Roy Hodgson’s squad. But not every Belgian footballer is a household name and of those on the fringes of the national team, by far the most interesting is a player who’s better known in Italy than Belgium. 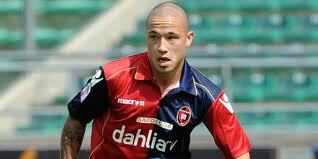 He’s Radja Nainggolan, 26, born in Antwerp of a Belgian mother and an Indonesian (Batak) father. Nainggolan’s upbringing was not easy as his father left the family before Radja reached school age, leaving his mother with five children and heavy debts. Nainggolan started his career with Antwerp club Germinal Beerschot – as did Thomas Vermaelen and Jan Vertonghen – but moved to Italy at the age of 17, eventually arriving in Serie A’s Cagliari in 2010. Now he’s regarded as one of the most capable midfield players in Italy’s premier division, playing more games and winning more tackles than any other player in the last three seasons. Despite his fearsome reputation, and the boy does like a tattoo, Nainggolan has hardly featured for Belgium. He’s appeared in a few friendlies, the first back in 2009, but he’s hasn’t lasted an hour in any game and the pressure seems to have got to him on the odd occasions he’s been selected. In January, after being linked to Juventus, AC Milan and Inter, Nainggolan eventually joined Roma in a complex loan deal that estimated his value at 18 million euros. At the last minute, Napoli – bitter rivals of Cagliari – tried to hijack the deal but Nainggolan turned down the move, despite the better terms. His lucrative transfer to Roma brought Nainggolan’s father back into the picture but Radja was not ready to forgive and forget. On the national team front, Nainggolan does feel unwanted by Belgium and recently told La Dernière Heure’s Kevin Centorame that he felt his performances in the last four years had at least merited him a place in the Belgian squad. His problem is that Belgium’s midfield is stacked with talent. Pointedly, Wilmots recently said that he saw Nainggolan as a box-to-box player rather than as a defensive midfield specialist where he played for Cagliari. Nainggolan’s plays for Roma in a more central role but there he’s in competition with such luminaries as Steven Defour, Moussa Dembélé and Marouane Fellaini. He would have stood more chance if Wilmots had seen him as an alternative, just in front of the back four, to Axel Witsel. That would have put him in direct opposition to veteran Timmy Simons. Simons has played 93 times for Belgium – close to the country’s record held by Jan Ceulemans – and in England would have been given the sobriquet of ‘a national treasure’. He’s now captaining Club Brugge but no longer has the legs for international football. Many pundits in Belgium have suggested Simons is upgraded to the coaching staff, as he’s hugely influential in the dressing room, but the smart money is on Simons making it into the ‘23’ while Nainggolan watches the World Cup from a bar near the Eternal City’s Spanish Steps. I wrote this in 2014.